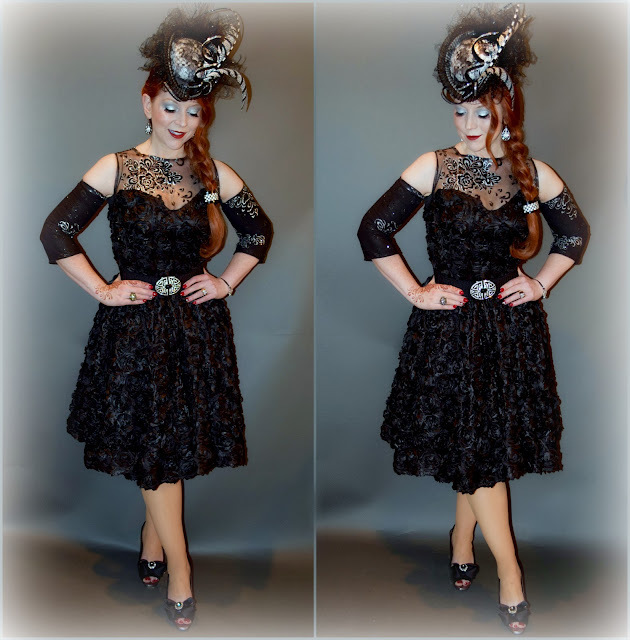 Red's Shoe Diaries: A Night Circus! As Erin Morgenstern said of the "Circque de Reves" in her best-selling tome (and a favorite of mine, no less), so it goes with the Indy 500. From annual tailgating in the Coke Lot to revelry (and perhaps a bit of debauchery) in the Snakepit, to drivers and pit crew members who can't help but snap photos and video even as they are the ones applauded through parade laps around the iconic yard of bricks, those who have discovered the magic in the World's largest one day sporting event feel the pull of the "greatest spectacle in racing" year after year. And, indeed, those who are strangers at the beginning of May (or even the beginning of the final Sunday in May) leave the Brickyard as friends, however fleeting. 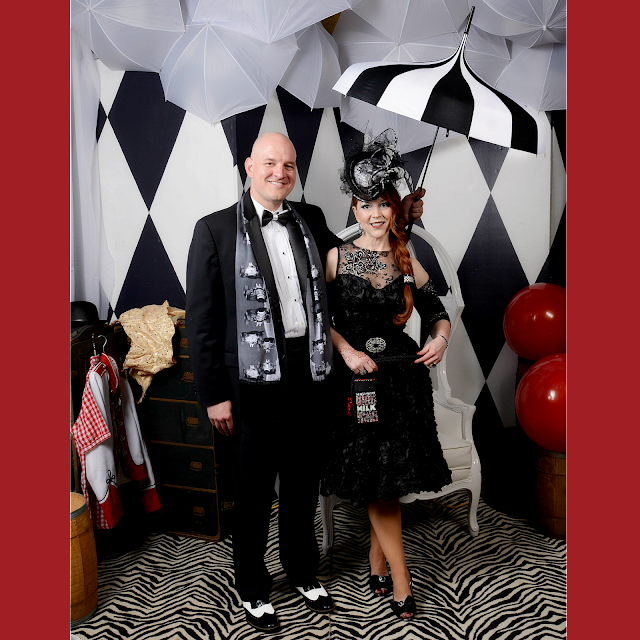 A "backstage" circus tent scene set up on one end of the ballroom was a fun photo op. It was with eager anticipation, then, that I opened the small black box that contained the invitation to this year's 500 Festival Snakepit Ball. 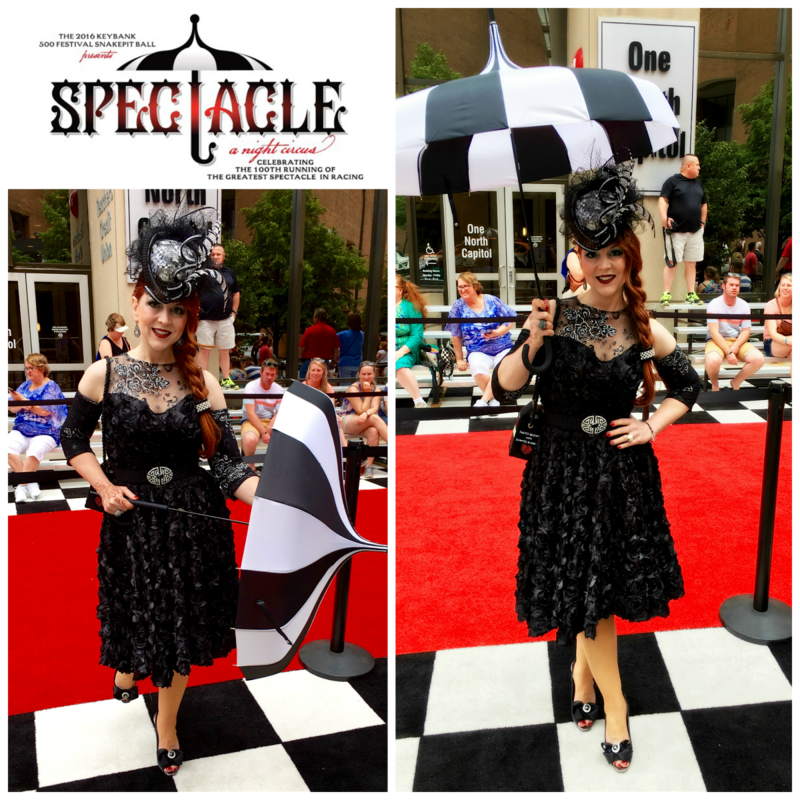 Amidst a cloud of sparkling red confetti nestled a small red glittering racecar announcing through a scroll of trailing black and white exhaust that this year's event would be over the (big) top: a Night Circus themed spectacle to celebrate this year's centennial running of the iconic race. I found these black satin and pewter metallic pumps, unworn, at local consignment store Simply Chic for $15. I added the bows (which are $1 children's hair clips from Wal-Mart, embellished with rhinestone clip earrings from local boutique The Secret Ingredient). I couldn't find the perfect shoes, so I made them! 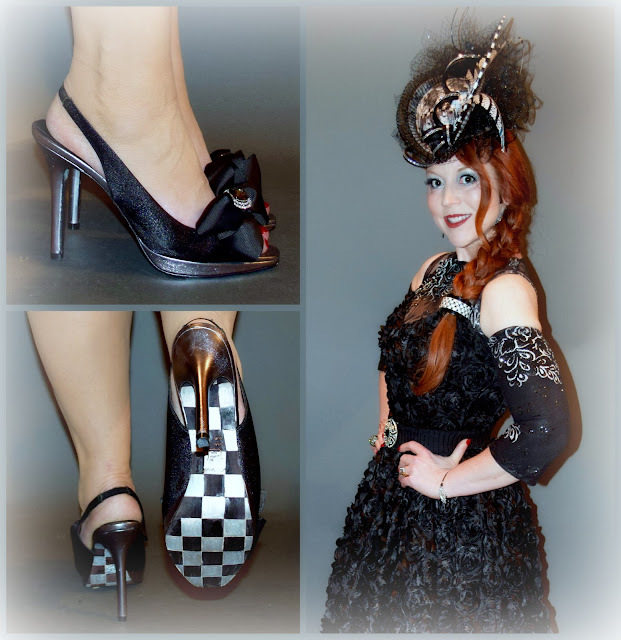 Between the sparkly additions and the checkered flag soles, they were completely transformed for the evening. The Snakepit Ball is an annual pre-race tradition and one of the few black tie galas in the Circle City so storied it actually has live televised red carpet coverage. This year's event, held at the Indiana Roof Ballroom and hosted by Colts quarterback Andrew Luck and girlfriend Nicole Pechanec, did not disappoint. The interactive theme offered a circus for the senses at every turn. From cotton candy cocktails and miniature root beer floats to mimes and a mardi gras style marching band, this was one party that that left me feeling like, well..., like a kid at the circus. There was a strong man and a sword swallower; there were aerialists and jugglers; there were owls and boa constrictors; there was a life-size rotating crystal racecar suspended under the black and white canopy of the big top. There was live music by Walk Off the Earth. There was an airbrush tattoo station with a running line all night, despite the fact that everyone in attendance was over 21. Truly, the night circus theme brought out the inner child in all of us. 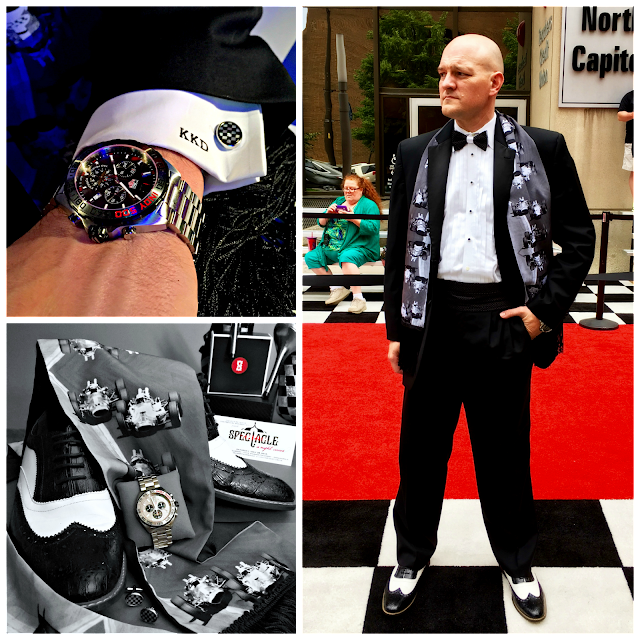 Mother of pearl checkered flag cufflinks; a limited edition 100th running watch from Tag Heuer; spectators; and a special scarf accessorized KDef's classic Ralph Lauren tux. 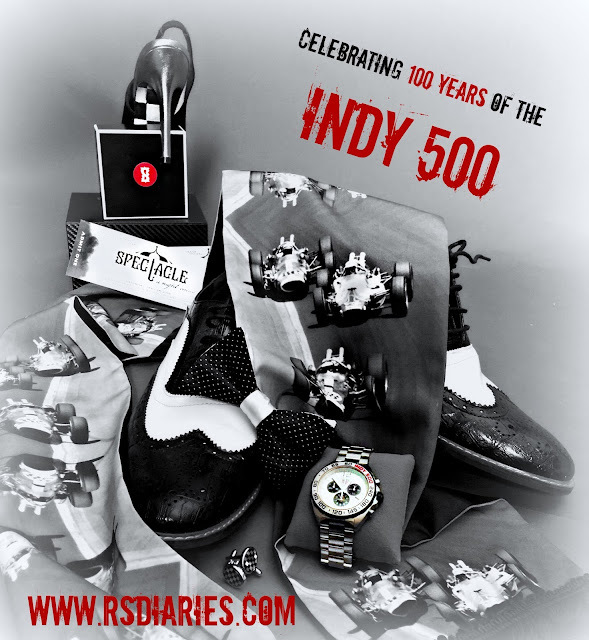 In keeping with Indy 500 tradition, it's common to see lots of black and white and checkered flag patterned attire at this particular soiree, but in honor of the 100th running, it was more prevalent than ever (and even encouraged), which added to the magical feel of the evening with its black, white, and red color scheme. 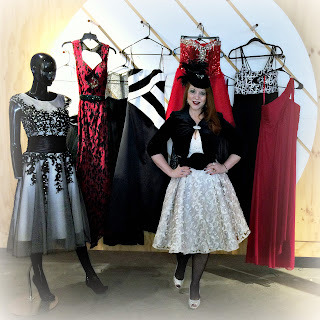 When you're going to a really big event where everyone will be wearing black and white, however, there's a decent chance that any dress you find in the city limits will also be worn by someone else (especially in Indy...especially in May). It's certainly not the end of the world. Indeed, it could be seen only as evidence of your impeccable good taste. On the other hand, no one wants to see someone else wearing the same dress at the same party. I avoided that potential altogether through a collaboration with local fashion designer Nikki Blaine. She created this black and silver dress in a classic Red's Shoe Diaries' silhouette specifically to complement my custom cocktail hat. The hat, too, was designed for this particular event, and features subtle images of the cars driven by race winner Jim Clark, Parnelli Jones, and AJ Foyt in the 1965 Indianapolis 500, along with a small checkered flag motif. 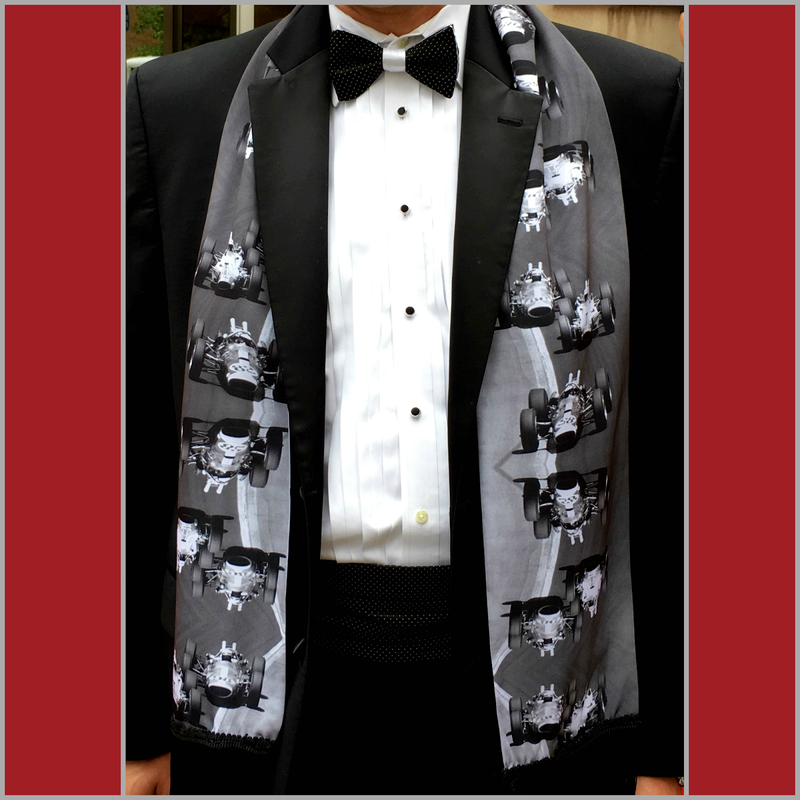 The custom cocktail hat was created by milliner Margie Ilane and features a more subtle version of the IndyCar motif on the scarf. Margie lives in Estonia and wasn't familiar with the Indy 500, but she was fantastic to work with and more than willing to incorporate my design idea into the over the (big) top hat. I used the same classic image of Clark, Jones, and Foyt rounding Turn 1 at the Brickyard in 1965 to design fabric that Nikki used to create a scarf for KDef. I've designed fabrics before, but this was my first for a formal garment (though the scarf is versatile enough to wear elsewhere). 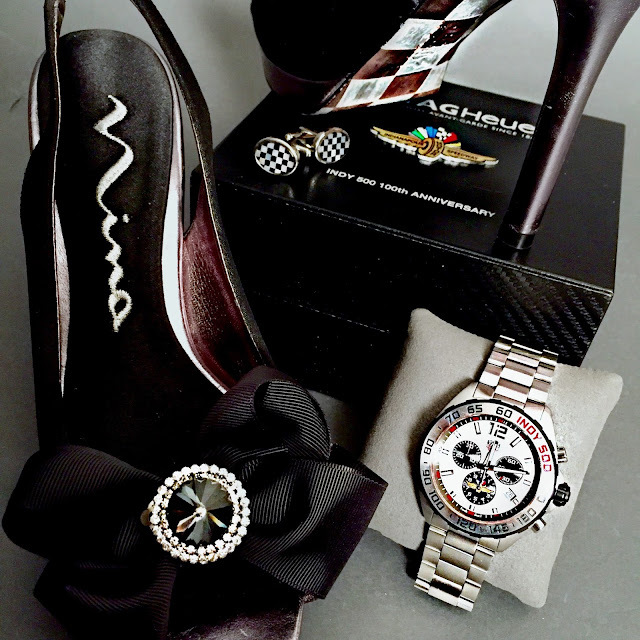 I couldn't be happier with how it turned out, and it was the perfect, unique complement to his mother of pearl checkered flag cufflinks and limited edition Indy 500 Tag Heuer watch commemorating the 100th running. Never one for moderation (though I sometimes strive for it), I couldn't stop there. 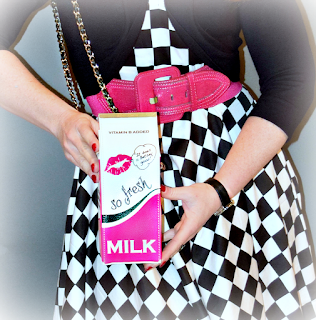 So I spent far too long with tiny crystals, tweezers and craft glue blinging out a custom "milk carton" purse... because what could be more appropriate to celebrate the Indy 500 than milk?! (Even the centerpieces lining long bar tables at the ball were lined with lighted milk bottles). In a spurt of last minute inspiration, I also took to the soles of my shoes with a black and silver sharpie so that I could wave a bit of the victory flag with every step. It was an ensemble perfectly appropriate for running away with the circus, even if only for an evening. 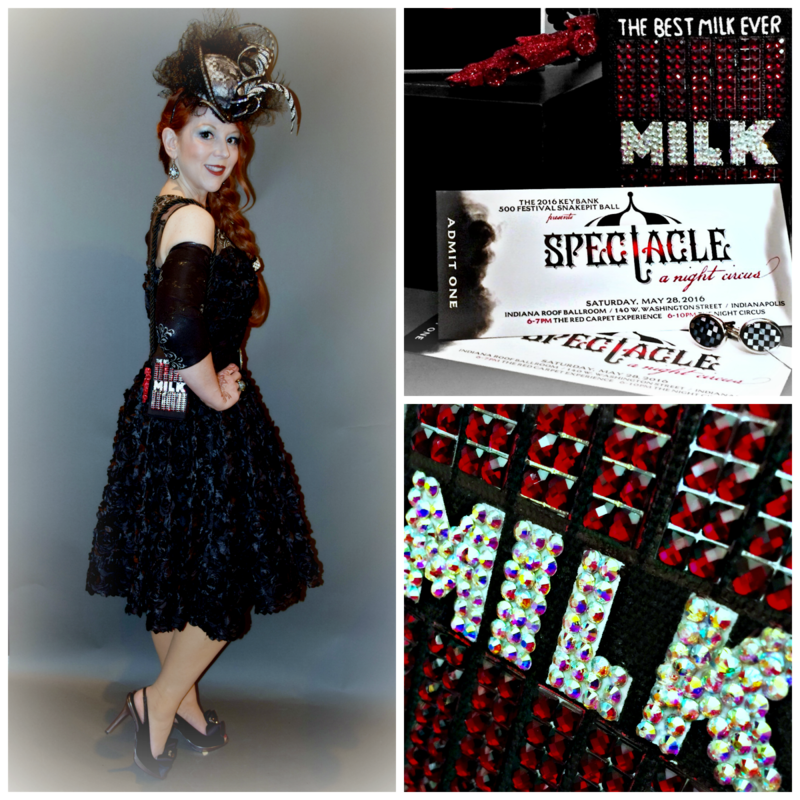 Applying hundreds of crystal to my "milk carton" purse with tweezers took far longer than I anticipated, but was totally worth the effort; so fun; and so me; The small red glitter racecar hanging off the side was part of the formal Snakepit Ball invitation.